When shopping for an optical enhancement device, you will find wide range price of similar looking devices and sometimes you feel overwhelmed by most of the information about these devices. Just like all other technologies, the field of binoculars has its own confusing terminologies. Ever wondered what the numbers 8×25 or 10-50×50 mean? Generally, binoculars are specified by a set of two numbers like 10×30, 8×54 and 10×54. The first number tells you the strength of the magnifications (i.e. how many times the subject is increased in size) while the second number is the objective lens sizes usually measured in millimeters. How large the objective lens is, determines the amount of light the binocular will take in for effective viewing. Other specs include the Angle of View, Exit Pupil Number, Eye Relief Number, Field of View, and Close Focus Distance. Understanding what the numbers mean will help you to choose the perfect pair of binoculars that will best suit your needs. Binoculars are often identified by a set of 2 numbers, these numbers show the magnification strength and the lens diameter. The first number represents the magnifications, magnification tells how many times closer the subject will appear as compared to the naked eye. 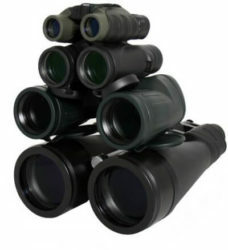 For example, the 10×30, 10×50 and 10×42 binoculars have a magnification of 10. Magnification power of 10 means that the subject will appear 10 times closer than it would to an un-aid eye, if you view a bird that stands 300 yards away through the 10x binoculars, it will appear to you as though it were 30 yards away (300 divided by 10). When you see 10-30×50 or 10-50×50, this means the binos are zoom and can be magnified from 10 to 30 and from 10 to 50 respectively. It is easy for some to assume that 10×30 means 10 is multiplied by 30, but that is very wrong. In fact, the ‘X’ represents the magnification, and for 10×30 binocular, the ‘X’ means 10 times the magnification. The objective lens is the lens at the front (i.e. pointing towards the subject) and not the one you look through. The second number represents the size of the objective lens diameter measured in millimeters. The size of the objective lens is what determines how much light the binocular can take in for effective viewing. 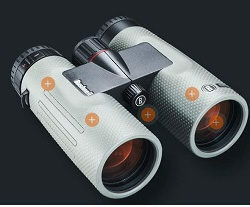 10×30 binoculars have a magnification of 10 and the objective lenses are 30mm in diameter. Note, the higher the number, the wider the objective lens and the more light the binocular will obtain making the image brighter. The lens size is very important as it affects the light gathering ability. However, binoculars having smaller objectives lens like 8×25, and 10X30 are more compact. 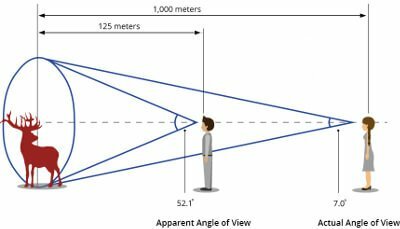 To explain what angle of View means, it is best to start with the field of view, which is the measurement of how wide an area is embraced in the binocular’s image. The angle of View is the Angle (measured in degrees) between the right and the left extremes of the field of view and the Centre of the objective lenses. The angular field of view can be converted to linear field simply by multiplying the angular field by 52.5. The field of view is the width of the area that can be viewed while using the binoculars. For instance, if two birds are standing 1000-yards away from you, one to your right and the other one to your left and the distance between these two birds is 360 feet, then we can say your field of view is 360ft at 1000 yards as you look through the binoculars. Generally, the higher the magnification, the smaller the field of view. Whereas, low powered binoculars give you a larger field of view. 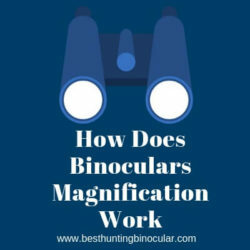 If you want to get a wide view, it’s preferable you use a low powered binocular, this is because higher magnification power results in a smaller field-of-view. A wide field-of-view is best to identify especially moving objects such as birds. The field of view can as well be expressed in degrees. The exit pupil is also one of the very important factors that determine how bright an object is viewed in low light conditions. Higher exit pupil number means brighter images. 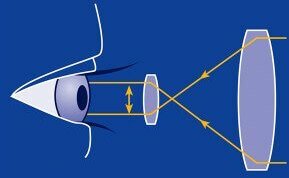 The exit pupil number is the diameter of the beam of light coming from the eyepiece. In other words, it is the diameter of the beam of light coming from the eyepieces of the binocular to your eyes. It is calculated based on the magnification power and the objective lens size. 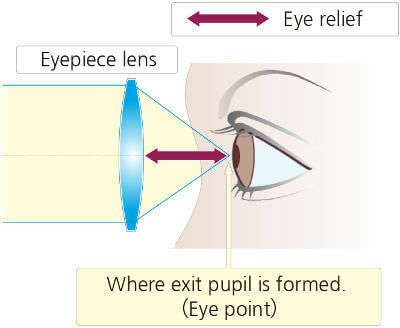 The actual exit pupil number measured in diameter is calculated by dividing the objective lens size by the magnification of the binocular. For example, 8×54 binocular would have an exit pupil of 6.75mm and a 10×50 binocular would have an exit pupil of 5mm. It is recommended that one should have a binocular that has an exit pupil number that equals his own pupils. This is because in poor light conditions our eyes pupil open to about 6 to 7mm wide thereby allowing more light to pass to the pupil. Whereas, in bright conditions, our eyes pupil contract to 2-4mm in size, in such conditions the extra light coming from a binocular with exit pupil number of 5-7mm isn’t needed. Finally, if you intend on using binoculars in bright or low light conditions, choose a pair whose exit pupil match your own pupils. Just like the field of view, the close focus distance also determines how much of the world one will be able to see through the binoculars. It is defined as the minimum distance an object should be in order to be within the focus range. 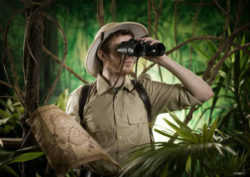 The close focus distance of a binocular generally depends on the optical design and to some extent on an individual’s eye vision. Close Focus Distance between 8-10 feet is Ideal for many outdoor activities but for general purpose binoculars, their close focus distance is around 20 to 25 feet. Eye relief is the length in millimeters between your eyes and each eyepiece while the whole field-of-view afforded by your binoculars is visible. Extended eye-relief minimizes eyestrain, this increases comfort when using the binoculars by allowing you hold the binoculars farther away from your face, this is ideal for spectacle wearers. Eye-relief is an important factor that should be considered when buying any optical enhancement device. When viewing an object using a binocular with an eye-relief below 10mm, one will only see the center of the image. Most binoculars have an eye-relief of 8-13mm. whereas, few have 16-18mm eye-relief. Generally, the longer the eyeglass the better and the friendlier a binocular is to eyeglass wearers. 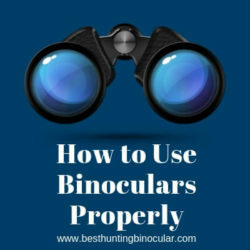 Understanding binoculars specs and terminologies such as exit pupil number, objective lens diameter, magnification power, field of view and eye relief number will help you in choosing a pair of binoculars that would best suit your needs. Binoculars come in various sizes defined by the size of the objective lens for various outdoor activities. Full-size binoculars are best for use on boasts and for wildlife viewing. These binoculars usually perform better even in low light conditions. The 10×42 and 10×50 are examples of full-size binoculars. The mid-size binoculars are best for sport and wildlife viewing. They are moderate in size and have average light transmission ability. The 10×30 and 7×35 are examples of mid-size binoculars. 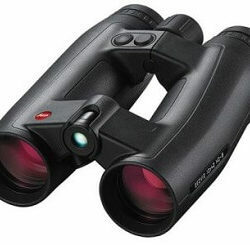 The last group is the compact binoculars, they are best for daytime usage. They are the smallest and the lightest binoculars, the 8×25 and 10×25 are examples of the compact binoculars.